What a gifted author Sue Whiting is. Everything she creates has meaning and beauty, regardless of genre. In A Swim in the Sea the child Bruno is off on his first day at the beach. With repetition and alliteration, the sharp text shows his preparation, excitement, then trepidation and finally his joy at being at the beach. The words gain momentum then collapse in union with the waves they describe, and that are depicted in full force by the illustrator. But the words would be just words without the outstanding full page illustrations created with acrylic paints by Meredith Thomas. She brings life to the text and the story the pictures tell, is more than what the author has written. There is no mention of the dog in the story, yet the dog is very much a part of the show. He is Bruno’s shadow and does what he does, feels what he feels, and makes the reader believe that the story is about him. Here are two brilliant creators totally in sync with one another. 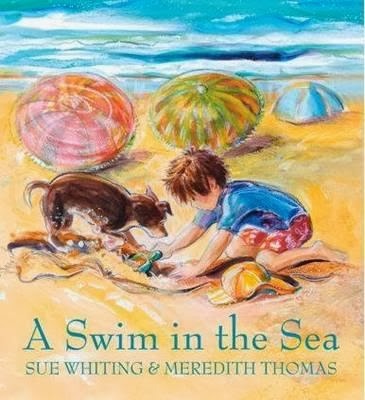 Beautiful and stylish in every way, with a cover that speaks volumes about the contents, this book is a must for the 3+ age group and lovers of exceptional picture books.